Flavia Abbate’s road to entrepreneurialism started when a consulting client asked her to create an executive health module for their business. The client wanted not just marketing communication that promoted health, but an actual program. Flavia collaborated with her identical twin sister’s husband, who happened to be a trainer to Mr. Universe, and they hit on a great formula. After the success of this first module, they rolled out other similar programs to other clients. The modules were so successful that in 1998, they started the first CityClinic. They wanted executives to have a dedicated physical space to learn more and get specialized health services. CityClinic offered a revolutionary approach by housing all experts under one roof—from physiotherapists to osteopaths to chiropractors. People in the industry thought they were nuts, since these disciplines tend to compete with each other. But to Flavia Abbate, the merging seemed like a natural approach: it’s more patient-centric to house all of these options in one centralized location. 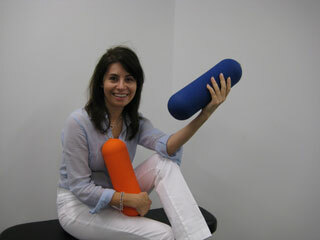 Five years after the success of CityClinic, Flavia and her team bought the assets for BodyBolster. Everyone at CityClinic was already a fan of this dowdy, grey physical therapy tool. So, on a tentative impulse, they tossed in a bid, never thinking that they would win. Next thing they knew, though, they owned BodyBolster. Flavia and the team spent the next eighteen months repositioning the foam roller (a device for stretching and muscle support) to make it more marketable, and it quickly became popular in both the rehab and general marketplaces. Today, CityClinic and BodyBolster combined employ forty-four people. The culture of both companies has stayed intact and smooth through the transitions over the years. Flavia attributes this cohesion to the entire staff having a personal interest in wellness. Almost all of the employees came to work there via word-of-mouth because they were drawn to the business. The glue between the team and the business is a deep interest in health for themselves, their community, and their clients—but they also have a lot of fun stretching and rolling on the floor together with the bolsters. Flavia Abbate shared the following lessons to help fellow entrepreneurs and business owners. Earlier in her life, Flavia had worked in a warm, nurturing ambiance cultivated by the owner of a publishing firm. Feeling like one of the family, Flavia believed that they could achieve anything while working there. The owner gave his team leeway to do and create beyond normal boundaries and to distinguish themselves and try new things. Everyone put in extra hours because they all felt part of something special towards which they could make a concrete contribution. This experience inspired Flavia to strive for the same type of culture at CityClinic and BodyBolster. Flavia relates to her team like real family members and has a very encouraging style. She connects with the team’s shared passion for the product and wellness for all. She doesn’t feel that they are working for her—she feels that she is doing this business along with them. Rolling up her sleeves or getting down on the ground to stretch is part of what makes them comfortable with her, and in turn, her enthusiasm rubs off on them. The health crisis and the mission to make people healthier drives Flavia and everyone who works with her. I learned from Flavia that Australia possesses an obesity problem. To combat this, CityClinic just acquired one of the first new Body Composition Analysis Technology machines. This machine measures visceral fat deposits around the heart, liver, and kidneys. In addition, you can get extremely accurate body-fat percentage measurements without being dunked into a tub of water the old-fashioned way. Flavia states that children as young as fifteen have musculoskeletal problems seen previously only in adults. This deeply concerns her, and she wants to raise awareness and tackle the issue. “It’s meaningful and important to me,” she asserted. When a company’s mission is about saving lives, it’s not hard to find enthusiastic people to sign on to your cause. Amazingly, all six of the employees at BodyBolster used the product before they worked there. I can’t think of any other organization with such a high ratio of groupies! In fact, Flavia spends exactly $0 in HR recruiting for BodyBolster. People specifically seek out openings at her company. To all business owners out there—how much do your customers and employees love your offering? The BodyBolster product resonates strongly with its users on an emotional level. They love it, identify with it, and associate it with being healthy and active. It has kind of a cult following, and this emotional attachment has been a strong asset that will carry the brand for years to come. To prepare for her annual reviews, Flavia Abbate outsources to an HR person. This individual collects and collates information for the direct reports whom she’ll review. Flavia has the luxury of outsourcing this task because the executive team takes careful notes during their monthly company performance reviews. These monthly reviews are then collected and rolled up for the annual January review, and no one is caught cramming to prepare days before the big assessment. At the end of each day, Flavia and her partners ask their staff three quick questions. What have you achieved today that was good? What was your enjoyment level today? They rate the enjoyment level on a scale of 1-5. This helps Flavia quickly catch and address any issues before they fester. Having a daily check-in is such a great idea. I typically do a standing huddle in the morning, but it also seems to work at the end of the day. Her three questions are also great to uncover progress, improvement opportunities, and a pulse on how happy each staff member is. Flavia and the team rally around the mission of health and fitness, which becomes the glue in the culture that keeps them inspired and motivated. She also lives and builds on the culture by holding many staff meetings with everyone in gym clothes, on the ground, and using their BodyBolsters to stretch, tone, and try out new exercises. I don’t think they’ll be training the next Mr. Universe anytime soon, but they’re definitely building more fans by creating healthier habits for their clients and community.